Manchester United manager Ryan Giggs enjoyed a winning start to his Old Trafford reign as goals from Wayne Rooney and Juan Mata saw off Norwich. Giggs, in temporary charge after the sacking of David Moyes, watched Rooney score a penalty and curling effort either side of half-time. Substitute Mata added a third and headed in from six yards to keep United in the hunt for a Europa League spot. Defeat leaves Norwich one point above the Premier League relegation zone. The Canaries arrived in Manchester at the end of a week in which United underwent a second managerial change in 10 months, with Giggs - the club's most decorated player - asked to take charge by United's vice chairman Ed Woodward. The 40-year-old promised a return to the traditional Manchester United style of play ahead of kick off, with "passion, speed, tempo, bravery and imagination," to the fore. A rapturous welcome greeted him as he emerged from the tunnel and with 962 appearances for the club, Giggs wrote United is "the rock his life had been built upon" in his programme notes. A 'good luck' card from United mascot 'Fred the Red' was also on offer for the Welshman and after a tepid opening half an hour, his side cruised to just an eighth home win of the campaign. United have now claimed 47 of their 60 points against sides in the bottom half this season and despite Norwich goalkeeper John Ruddy smartly saving from Danny Welbeck and Antonio Valencia, Neil Adams' side could not kill the feel-good factor at Old Trafford. Norwich's fifth successive defeat, an unwanted stat they last achieved when relegated in 2005, looked a formality when Rooney took centre stage twice in seven minutes. The England striker - United's talisman without the injured Robin van Persie - sent Ruddy the wrong way from the spot after Steven Whittaker had clumsily tangled with Welbeck. Then, when the teams re-emerged from the interval, his 17th league goal of the season arrived as he fired in off the post from 25 yards despite slipping when shooting right footed. Welbeck - one of six changes made by Giggs from the 2-0 defeat at Everton - drilled a smart half volley forcing Ruddy to again save, but Mata replaced him from the bench to end the contest. January signing Juan Mata has now scored five goals in his last four appearances for United. The record signing - made by Moyes - volleyed in Phil Jones's cross six yards out, seconds after Rooney had been denied a hat-trick by another Ruddy save. Playing in a central role, the Spaniard again found himself in the box to touch home Valencia's cross-shot for his fifth United goal after good work down the left by Patrice Evra. Norwich, for all their early bravery at the back, had capitulated, but went close to a consolation when substitute Johan Elmander fired wide and Martin Olsson's deflected effort crashed against the crossbar. The Canaries face Arsenal and Chelsea in their run-in and will be in the bottom three on Sunday afternoon if there is a winner in the midday kick-off between Sunderland and Cardiff. United, who should have added a fifth when Javier Hernandez missed a one-on-one opportunity in injury time, sit six points behind sixth-placed Tottenham. "I think we did really well in the first half and frustrated them but then five minutes before the break they get a penalty. There is minimal contact and that changes the game. "In the second half we were not good enough. We allowed Wayne Rooney too much time and space to get in a shot and we did the same last week against Liverpool when Raheem Sterling scored. "We had a go after that but it is difficult when you are 2-0 down away from home. I felt we should have done better. We have got two games left and probably have to take points from them. "Overall, it wasn't good enough but we are still above the [relegation] line. What we can't do is beat ourselves up." Match ends, Manchester United 4, Norwich City 0. 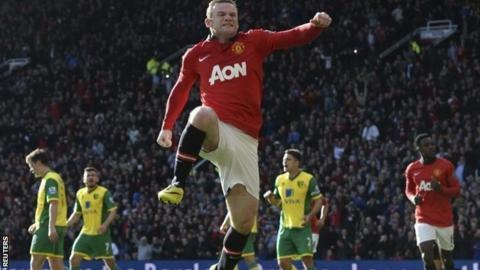 Second Half ends, Manchester United 4, Norwich City 0. Steven Whittaker (Norwich City) wins a free kick on the right wing. Attempt missed. Javier Hernández (Manchester United) right footed shot from the centre of the box misses to the left. Assisted by Juan Mata with a through ball following a fast break. Attempt missed. Bradley Johnson (Norwich City) right footed shot from the centre of the box is too high. Assisted by Gary Hooper following a corner. Corner, Norwich City. Conceded by Phil Jones. Attempt blocked. Martin Olsson (Norwich City) left footed shot from outside the box is blocked. Attempt missed. Robert Snodgrass (Norwich City) right footed shot from the left side of the box is close, but misses the top right corner. Assisted by Martin Olsson. Corner, Norwich City. Conceded by David de Gea. Attempt saved. Bradley Johnson (Norwich City) left footed shot from outside the box is saved in the bottom left corner. Attempt missed. Ashley Young (Manchester United) right footed shot from outside the box is high and wide to the right. Assisted by Luis Antonio Valencia. Attempt missed. Wayne Rooney (Manchester United) right footed shot from outside the box is just a bit too high. Attempt missed. Phil Jones (Manchester United) left footed shot from the right side of the box misses to the left. Assisted by Juan Mata. Substitution, Norwich City. Alexander Tettey replaces Leroy Fer. Attempt missed. Johan Elmander (Norwich City) left footed shot from the centre of the box is close, but misses to the left. Attempt blocked. Bradley Johnson (Norwich City) left footed shot from outside the box is blocked. Assisted by Johan Elmander. Attempt saved. Luis Antonio Valencia (Manchester United) right footed shot from outside the box is saved in the bottom left corner. Assisted by Juan Mata. Attempt missed. Ashley Young (Manchester United) right footed shot from outside the box is close, but misses to the right. Assisted by Michael Carrick. Corner, Norwich City. Conceded by Rio Ferdinand. Goal! Manchester United 4, Norwich City 0. Juan Mata (Manchester United) header from very close range to the bottom left corner. Assisted by Luis Antonio Valencia. Attempt missed. Luis Antonio Valencia (Manchester United) right footed shot from a difficult angle on the right is close, but misses to the left. Assisted by Patrice Evra with a cross. Substitution, Manchester United. Javier Hernández replaces Tom Cleverley. Attempt saved. Juan Mata (Manchester United) left footed shot from the centre of the box is saved in the bottom right corner. Assisted by Wayne Rooney with a cross. Substitution, Norwich City. Gary Hooper replaces Nathan Redmond. Tom Cleverley (Manchester United) wins a free kick in the attacking half. Attempt missed. Bradley Johnson (Norwich City) left footed shot from outside the box misses to the right. Assisted by Leroy Fer. Attempt blocked. Jonny Howson (Norwich City) right footed shot from outside the box is blocked. Assisted by Robert Snodgrass. Substitution, Manchester United. Ashley Young replaces Shinji Kagawa. Patrice Evra (Manchester United) is shown the yellow card for a bad foul. Foul by Patrice Evra (Manchester United). Goal! Manchester United 3, Norwich City 0. Juan Mata (Manchester United) left footed shot from very close range to the centre of the goal. Assisted by Phil Jones with a cross. Attempt saved. Wayne Rooney (Manchester United) right footed shot from outside the box is saved in the top right corner. Assisted by Patrice Evra. Substitution, Manchester United. Juan Mata replaces Danny Welbeck. Tom Cleverley (Manchester United) wins a free kick in the defensive half.